You don’t have to be a diver to enjoy Gaya Island and the Tunku Abdul Rahman Park. There are plenty of activities available that show you beautiful coral reefs, tropical fish, sheltered ocean lagoons and primary rainforest. Whether a friends & family day trip, group or school adventure, honeymoon or holiday, time and time again our guests tell us how wonderful it is to spend the day together on such a lovely tropical island where everyone can enjoy their activity at the same location away from the crowds. 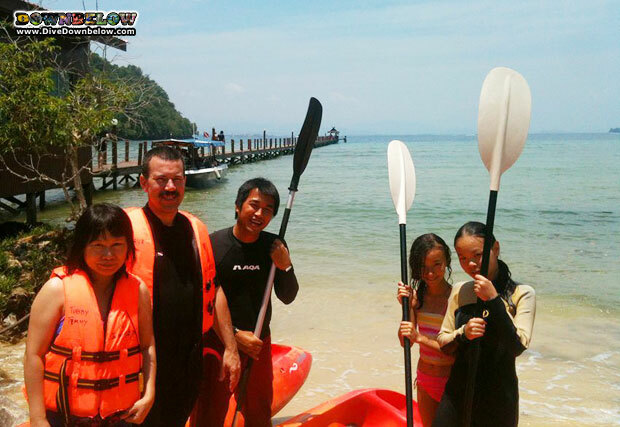 You can pick and choose from guided snorkelling safaris, trekking or sea-kayaking. You can even do all of them all in a single day. Our guests pictured above choose to spent their day under the sun with a multi-activity program that includes a snorkelling, trekking and kayaking with IDC Staff Instructor Strike. Find out what else you can do on our tropical island! Contact us if you have any enquiries.